IIT JAM 2019 result has been declared. Indian Institute of Technology Joint Admission Test (JAM 2019) for M. Sc. is a national level examination. And, all the IITs (Indian Institutes of Technology) and IISc (Indian Institute of Science) organize this test on a rotation basis. And, the students apply for this examination to get admission in M. Sc. (Four Semesters), Joint M. Sc. – Ph. D., M. Sc. – M. Tech., M. Sc. – Ph.D. Dual Degree, and other offered courses. Furthermore, admit card for IIT JAM 2019 has been released on 08 January and exam will be held on 10 February 2019. 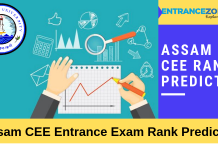 Also, the students get admission in top colleges and universities of India such as IITs and IISc for these courses on the basis of their performance in IIT JAM 2019. Interested Candidates can apply for JAM 2019 through JAM Online Application Processing System (JOAPS) only. The facility for Online Registration and Application is available from 05 September 2018. Latest Update: IIT JAM 2019 Result has been declared. 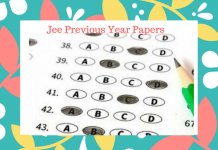 IIT JAM 2019 Score Card has been released on 02 April 2019. 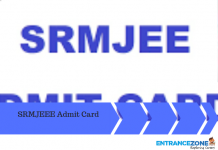 IIT JAM 2019 Exam Admit Card has been available 08 January 2019. Check admit card details here. Courses: M.Sc. (Two Year), Joint M.Sc.-Ph.D., M.Sc.-Ph.D. Dual Degree, and other post-bachelor’s degree programs. The schedule is released by IIT JAM authority. The date of examination is changed to 11 February from 10 February 2019. IIT Bombay released the following details of Test Schedule. Rank List: All India Rank will be published by organizing Institute to each candidate appeared in the TEST. Tie Breaking Rule: The candidate will be given higher rank whose ratio of positive marks to negative marks will be higher. And, If this criterion fails, then the same rank will be awarded. Merit List: The merit list will be prepared on the basis of All India Rank (AIR). And the merit list depends on the seats available in each category (OBC-NCL, SC, ST, and PwD) in a given subject. Admit Card containing all details of the candidate i.e Candidate’s Name, Registration Number, Photograph, Signature, and Name(s) and Code(s) of the Test Paper(s) applied. Also, the Name and Address of the Test Centre allotted. The Candidates are advised to check the details of Admit Card according to entries made by him in the application form. 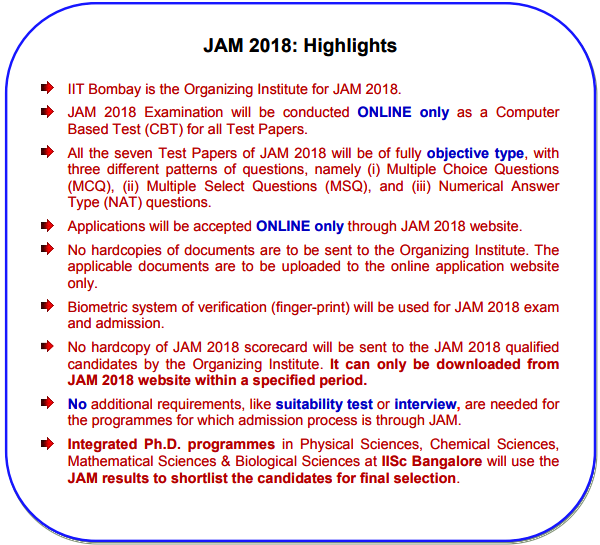 In case of any discrepancy, the applicant must inform the organizing committee of JAM 2019, IIT Bombay immediately. 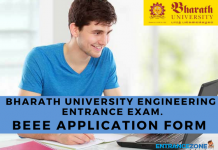 The Applicants must carry ADMIT CARD along with valid government ID proof (given at the time of filling the application form) to the examination centre. No Candidate will be allowed for the TEST without admit card & ID Proof. The Admit Card may be withdrawn by organizing institute if in any case the candidate’s is not fulfilling the eligibility criteria lead by IIT Bombay at the time of application form. Note: The candidates are advised to preserve the JAM 2019 Admit Card carefully. As it may be asked at the time of admission by the Institute. Firstly, the students need to visit the official website and submit the Online Application Form. The online application forms have been released. Here, the aspirants have to register themselves by entering their Full Name, E-Mail ID, Contact Number, and Password. Then, after successfully registering, the applicants will receive a system generated an email containing their Enrollment ID. Next, the candidates have to log in through the Enrollment ID and Password and fill the asked details in the Online Application Form. Further, the students should upload their recent photograph and signature, and category certificate (if applicable). Then, the application fee should be paid through online mode only. Moreover, before finally submitting the application form, check all the filled entries. Finally, the applicants should take a printout of the Online Application Form and keep it safe for future reference. The Application Fee for IIT JAM 2019 can be paid through online mode only (Net Banking / Credit Card / Debit Card). The IIT Bombay, the organising institute of JAM 2019 released the Mock test and link for Mock examination is available now on the official website as well as can be accessed from here. Firstly, all the candidates irrespective of their nationality are eligible to apply for IIT JAM 2019. Then, candidates must possess a Bachelor’s degree in any stream from any recognized college or university. Next, the applicants must have secured at least 55% marks (for candidates belonging to Unreserved, and Other Backward Classes – Non-Creamy Layer) or 50% (for candidates belonging to Scheduled Castes, Scheduled Tribes, and Persons With Disability). Finally, the students appearing in the final year of the qualifying examination can also apply for IIT JAM 2019. The detailed Minimum Educational Qualifications for Admission along with Test papers and programs are given here in the link. The IIT JAM 2019 application forms have been released. Apply now. 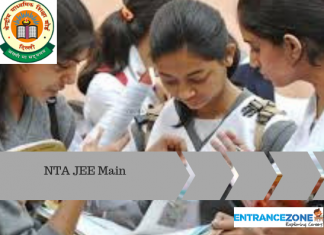 The CCMN 2019 (Counseling Body for Admission to NITs & CFTIs) will admit students through qualified JAM 2019 scores. Also, IISER Pune and Bhopal will admit students through qualified JAM 2019 scores. Stay tuned with EntranceZone for more updates and information related to IIT JAM 2019. I am a student of 3rd year B.Sc. in mathematics (honors) and wanted to do M.Sc. in physics from IITs. Do I am eligible for the IIT JAM exam in the Physics. What is the IIT JAM admission procedure and requirement to get into Bombay IIT. What will be study plan if I am preparing it IIT JAM without coaching in 3rd year. Yes, you are eligible for IIT JAM but it’s necessary that you should be completed your graduation before the admission. IIT JAM is one of the toughest entrance exams. It requires attentive mind, dedication, and self-belief. Here are some tips to prepare for it. Analyze the complete syllabus, it’s necessary to make a proper strategy. All you need is a good study material. Prefer the best reference books which cover most of the topics of the syllabus and contains previous years question papers and model test papers also. Practice mock tests through this you will get an idea about the paper pattern and time estimation. Study hard at least 7-8 hours daily. Don’t get stressed, keep calm and prepare well. I am an engineering student. I have cleared my final semester exams, but I still have to give my back exams which will be in November 2017. So, am I eligible to write IIT JAM exam? Yes, you are eligible to write JAM exam. But at the time of your admission, you must have your Bachelor’s degree with you. At the time of admission, you will also have to submit a physical fitness certificate from a registered medical practitioner in the prescribed form. You may also have to undergo a physical fitness test. If you found physically unfit, your admission must be cancelled. 1. Candidates must have a Bachelor’s degree from any stream, from any recognized University. 2. Both Indian as well as Foreign candidates can write IIT JAM Exam. 3. There is no age limit to write JAM Exam. 4. Candidates appearing for their final year exams, are also eligible for JAM Exam. 5. Candidates must have minimum of 55% marks for General & OBC categories and 50% marks for SC/ST/PwD categories in their qualifying degree. 6. Candidates also need to submit a physical fitness certificate at the time of their admissions. If any candidate found unfit to pursue his/her chosen course, there admission will be cancelled. can you suggest me some reference books which will help me to prepare JAM exam for msc- chemistry ??? I got 25.67 points in IIT JAM 2019 Mathematics, if i Qualify can i get any NIT? Also is any university giving admission on the basis of JAM score Card?